Stay two nights in Memphis, where your expert Local Guide knows Memphis’ history, as well as the hard-to-find, hidden Elvis sites. In addition to guided sightseeing, your Memphis experience includes visits to the Stax Museum, dedicated to American Soul music; the Rock ‘N’ Soul Museum, tracing Memphis’ cultural and musical past; and Sun Studio, probably the world’s most famous recording studio. Here, you’ll touch Elvis’ first microphone and relive the studio’s history. From Memphis, take an excursion to Tupelo, Mississippi, to visit Elvis’ Birthplace & Museum. This small, two-room house was built by Elvis’ father. Enjoy seeing memorabilia from Elvis’ childhood. 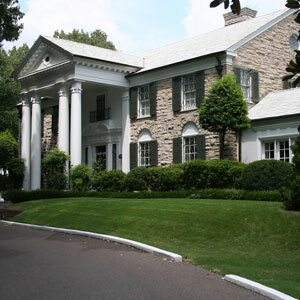 You’ll also journey to Graceland, Elvis’ palatial estate. Here, stay two nights at the Guest House at Graceland and walk through the same rooms he did. You’ll even board his private jet! Also visit the Meditation Garden, where Elvis went to reflect on life and where he is laid to rest. Today you will feel like a part of Memphis as you experience this amazing city on your guided city sightseeing tour. Your expert Local Guide knows Memphis history like no one else—including the inside, “backstage” stories from the folks who were there, as well as those hard-to-find, hidden Elvis sites (his Lauderdale Courts apartment, Humes High School, the Overton Park Shell Theatre where Elvis gave his first paid concert, places where he worked and played, and many others). For music lovers, a visit to the STAX MUSEUM of American Soul Music is next. Stax celebrates great Memphis soul music made famous by Otis Redding, Booker T. and the MG’s, Aretha Franklin, and others. Then, on to the ROCK ‘N’ SOUL MUSEUM, which traces Memphis’ cultural and musical past. End the day with a visit to SUN STUDIO, probably the most famous recording studio in the world, where rock ‘n’ roll was first recorded. Hear outtakes from sessions, touch Elvis’ first microphone, see memorabilia, and relive the history of the studio that launched the careers of Johnny Cash, BB King, and many other music legends. Today we journey to Tupelo, Mississippi, to visit the ELVIS’ BIRTHPLACE & MUSEUM, a small, 2-room house built by the singer’s father, Vernon Presley. You will also visit the Elvis Presley Museum, featuring “Remembrance of Things Past,” an exhibit displaying memorabilia from Elvis’ childhood. It’s here that you can see, feel, and touch where the “King of Rock ‘n’ Roll” began his musical journey. Return to Memphis, and check in to the Guest House at Graceland for the next two nights. Today is dedicated to a guided audio tour of GRACELAND. Experience life as Elvis did by walking through the decadent and quirky rooms where he felt truly at home. Finish your tour of Graceland with a visit to the Meditation Garden, where Elvis often went to reflect on life, and where he is now laid to rest along with members of his family. You’ll also be able to board “The King’s” private jet! Today we head to Nashville—“Music City USA.” Visit the JOHNNY CASH MUSEUM, where you will see never-before-seen historical documents, awards, costumes, and instruments. Then settle in for a PRIVATE PERFORMANCE & DISCUSSION with Johnny and June’s only son, John Carter Cash. John Carter will entertain you with his own original music, as well as a few numbers made famous by his legendary family, and he’ll even be available for photographs and autographs afterward. In the event that the performance with John Carter Cash is not available, a private performance with Granddaughter of Johnny and June Cash or youngest brother of Johnny Cash will be substituted. The Cash family will share their memories and perform the songs of Johnny Cash. All performances are subject to availability. Nashville is the ideal destination for music fans, history buffs, and lovers of the South. Start your day with a visit to STUDIO B, Nashville’s oldest surviving recording studio and one of the country’s most important. Between 1957 and 1977, more than 35,000 songs were recorded here, including 262 Elvis Presley recordings. Studio B is a “must-see” for any music fan, but especially for those who love Elvis. Afterward, enjoy an orientation tour of the city, passing by famous Music Row recording studios, the center of the recording industry, which first developed in the 1950s. Get behind the scenes of the music industry by visiting the COUNTRY MUSIC HALL OF FAME with its glittering costumes, rare instruments, and Elvis Presley’s “solid-gold” Cadillac. Tonight, see an unforgettable show at the world-famous GRAND OLE OPRY, the world’s premier country music venue since 1925 and the setting for the nation’s longest-running music show. Today is at leisure to explore more of this vibrant city. You may choose to visit the historic Ryman Auditorium, restored home of the Grand Ole Opry from 1943-1974. Perhaps visit the Hermitage, home of Andrew Jackson, seventh president of the United States, where you’ll have an opportunity to view the fully restored mansion, walk through the gardens, and see the tomb of the late president. The trip ends today with guests departing on individual schedules. Transfers to Nashville International Airport are included. You can extend your vacation with extra nights and explore “Music City USA” further with a variety of exciting optional activities. 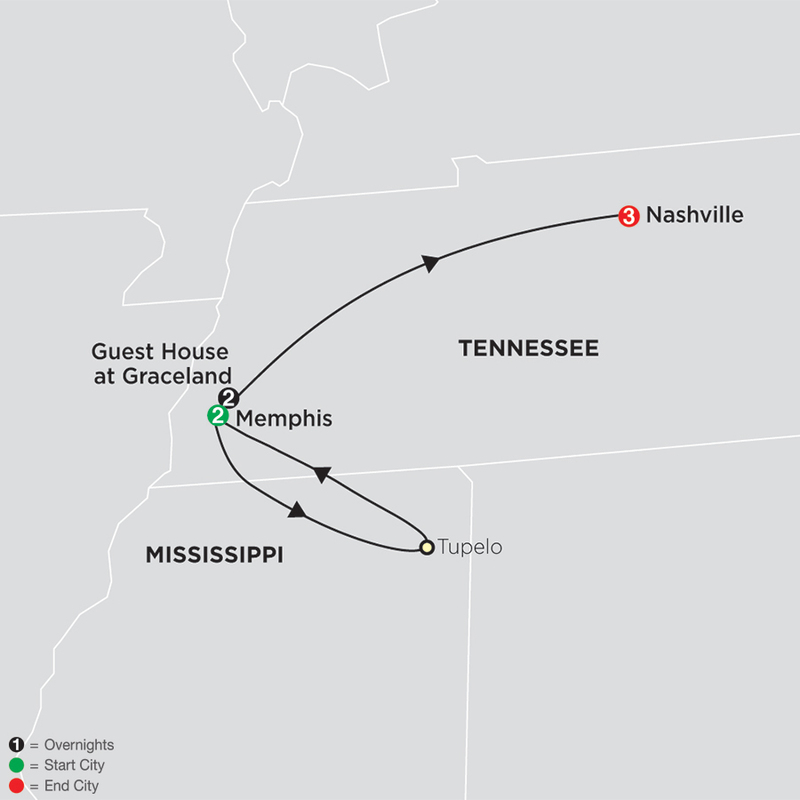 In Memphis; orientation tours in Tupelo and Nashville, Stax Museum, Rock ‘n’ Soul Museum, Sun Studio, Elvis Presley Birthplace & Museum, Graceland, Johnny Cash Museum, private performance with John Carter Cash, Country Music Hall of Fame, Studio B, and reserved premier seating at the Grand Ole Opry. Inside visits as shown in UPPERCASE in the tour description, including admission charges where applicable. Local Guide for sightseeing in Memphis; services of a professional Tour Director.